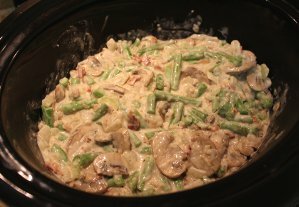 You can say "goodbye" to mushy, flavorless green bean casserole for good, thanks to this recipe for The Best Green Bean Casserole for Your Holiday Table. 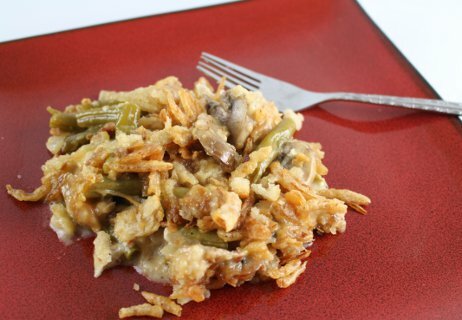 Made with fresh green beans, mushrooms and onions, this easy green bean casserole recipe is sure to steal the show at any holiday party or gathering. 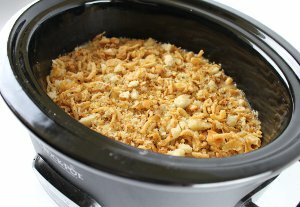 Not only is this side dish packed with tons of ingredients inside of the casserole, but it is also topped with a delicious combination of toasted fried onions, sourdough bread crumbs and Parmesan cheese. A green bean casserole wouldn't be the same without its characteristic fried onion topping, so we made sure to showcase the topping in our rendition. Even if you are only bringing one dish to your holiday parties this year, make sure that one dish is a show-stopper. 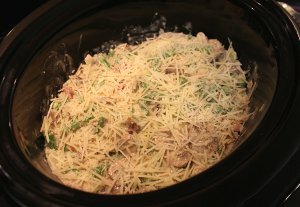 This green beans casserole with cheese will bring people together and fill everyone's hearts and bellies with happiness. What more could you ask for during the holiday season? Note: Swiss cheese pictured in the image above was omitted from the recipe. 1. 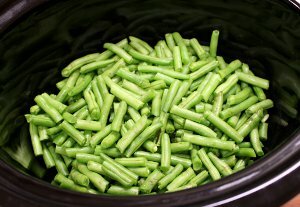 Wash the green beans and snap the ends off each side. Cut the beans into 2-inch segments and set aside to let dry. 2. Pulse 1 cup of friend onions in a food processor until finely ground. Reserve for later steps. 3. Pulse sourdough bread in the food processor to coarse crumbs (about 10 pulses). 4. Melt 2 tablespoons of butter in a large skillet over medium heat. 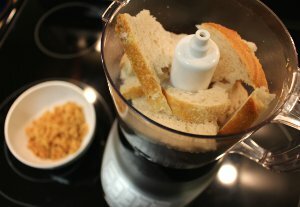 Add the pulsed sourdough bread and the remaining 2 cups of un-pulsed fried onions. Toast until golden brown (about 5 minutes). Set aside. 5. Wipe the skillet clean and melt remaining 3 tablespoons of butter in it. 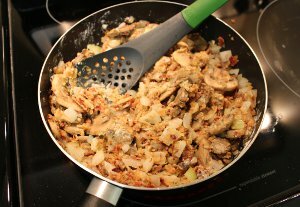 Cook the chopped onion in the skillet for a few minutes, and then add the mushrooms, thyme, salt, pepper and bacon to the pan. 6. After cooking the mushroom mixture for about 8 to 10 minutes (until the mushrooms are softened and lightly browned), stir in the flour and the processed fried onions. Cook for 1 minute. 7. Slowly whisk the broth and cream into the pan, scraping up browned bits and smoothing out lumps. 8. 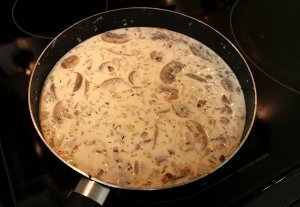 Bring the mixture to a simmer and cook for about ten minutes until it is extremely thick and creamy. Stir occasionally. 9. Add the beans to the slow cooker and pour mushroom sauce over the top of them. Stir beans and sauce together until well mixed. 10. Sprinkle fresh parmesan cheese over the top of the ingredients. 11. Cover and cook on HIGH for 2 1/2 hours or on LOW for 5 hours. 12. 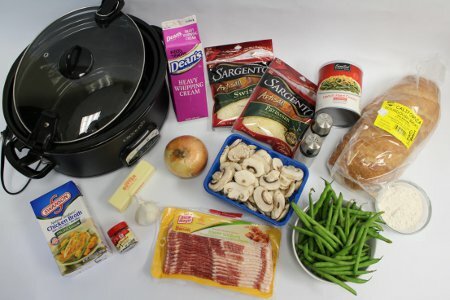 In the last hour of cooking, lay a piece of paper under the lid of the slow cooker to absorb the moisture. 13. Sprinkle half of the reserved fried onion and bread crumb mixture over the top of the beans with 15 minutes of cooking remaining. 14. Sprinkle the remaining friend onions and bread crumbs over the dish just before serving. 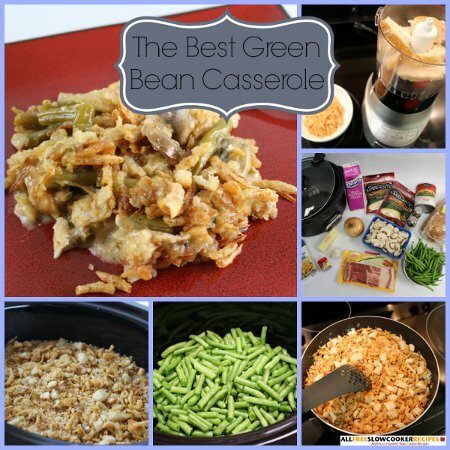 Green bean casserole probably has got to be one my favorite all time side dishes for the holidays...I really love the more deluxe style casseroles similar to this one instead of the traditional mushroom soup version but, I've never had it with bread or Parmesan cheese. 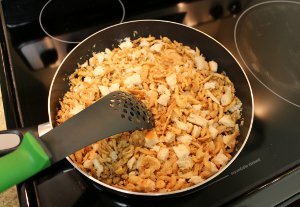 The only thing I'd do different though, is make my own fried onions as opposed to can. I used them before too... until I saw a cooking show where they sliced their onions super thin, dredged them lightly in corn starch and fried them. I've never looked back since then!